Manifest Destinitis: An early California adaptation of Moliere's "The Imaginary Invalid"
Don Aragon is a very sick Californio. His head aches, his bowels are troubling him and he has a fear of losing everything to foreigners. He has Manifest Destinitis. Between the end of the Mexican-American War and the start of the Gold Rush craze, this madness is infecting all of Alta California. When the Don’s medical bills start to pile up, he arranges to marry his daughter Angelica off to a young doctor. Of course, she has her sights set on someone else—a guapo Americano! Thank goodness for Tonia, played by Herbert Siguenza, Don Aragon’s loud mouth native India servant, who hears all, sees all and fixes all with much cunning and clowning. From REP audience favorite Siguenza, one of the founding members of Culture Clash and the award-winning writer of El Henry, A Weekend with Pablo Picasso and Steal Heaven, comes this surprisingly modern adaptation of one of Moliere’s comic masterpieces. Just in time for the fall presidential campaign debates, this hilarious mixture of contemporary political satire, romantic triangles, double entendres and mistaken identities promises to leave you in stitches. One of the founding members of Culture Clash, Herbert Siguenza is the award-winning writer of El Henry, A Weekend with Pablo Picasso and Steal Heaven. 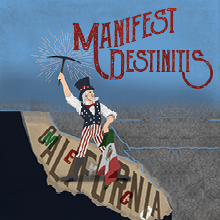 Manifest Destinitis is supported in part thanks to the generosity of Dr. Irvin and Dr. Donna Silverstein, Mason and Lynne Rosenthal and Scatena Daniels Communications.